For the first time in living memory, New York has spent a day entirely without violent crime. The city police department's chief spokesman said that Monday was the most bloodshed-free 24-hour period in recent history. Not a single murder, shooting, stabbing or other incident of violent crime was reported for a whole day. Despite a July spike in homicides, the city's murder rate is on target to hit its lowest point since 1960. Just a few months ago, residents were living through what one tabloid newspaper called the "summer of blood". Despite the fall in homicides, statistics point to a 3% overall rise in crime. There has also been a 9% increase in larceny, which police blame on a surge in smartphone thefts. But killings are now down 23% compared with last year, which represents a 50-year low. There have been 366 murders so far this year in New York City, compared with 472 at this time last year. 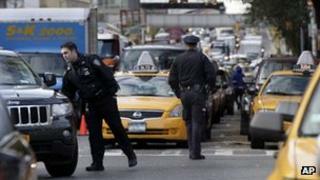 Experts say such a low number of homicides is highly unusual for a US city of eight million people. Gang-plagued Chicago, Illinois, has chalked up 462 murders this year, despite having a population of about 2.7 million people. There have been 301 murders in 2012 in the city of Philadelphia, which has 1.5 million people. Some experts are praising the New York police department's aggressive crime-prevention tactics, notably the so-called Stop And Frisk policy, which has rooted out dozens of illegal guns. But critics argue that it has led to hundreds of thousands of young blacks and Latinos being stopped without cause. What happened to crime in New York City?